Banking sector offers one of the prestigious opportunities to work for the government sector. Aspirants looking for a job in banking sector often have a lot of doubts about the options available to them. There are various bank exams conducted in India for the same. SBI and IBPS are the most renowned career options when it comes to bank jobs. Apart from these, there are many other bank exams like RBI Assistant & Grade B, NABARD Development officer etc. In this post, we have covered some important points on how SBI clerk exam is different from other bank exams in different categories. 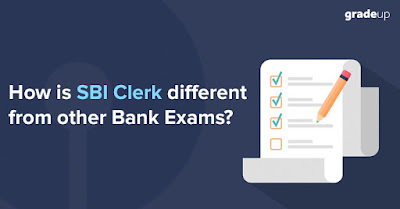 So, read this post now to understand how the SBI Clerk bank exam is differ from other and analyze by yourself that which of them will be valuable for you. In any bank, clerk is the one who is reached out by all in any situation. A clerk’s job is to handle all the queries of customers quickly and do all the related work. Clerical staff is responsible for almost every task whether it is SBI or IBPS. A Clerk performs most of the tasks in a bank from filling the data entries in computer, handling the customers and solving their problems as soon as possible, etc. But, NABARD and RBI have some other function for its development assistant. Their main duty is to perform the administrative tasks. They help in bringing money from different corporations to their respective banks. They are also required to deal with policy issues of various programmes of Government. They also handle the projects related to Agriculture and Rural Development. Similarly, for RBI assistant, they deal with receiving and forwarding of mail and doing data entry work. Bank Details & Job Locations! IBPS is the self-recruitment agency that conducts the exam for 19 Public Sector Banks and 56 Rural Regional Banks. In all these banks, you can get posted anywhere across India. SBI, RBI and NABARD conduct their own recruitment exams. SBI has more than 24,000 branches across the world, offering more options for job postings. For SBI Clerk: The candidates posted as Junior Associate through the SBI exam can be transferred only after completing 5 years of their service. But, the candidates who are selected under special recruitment drive in Tura and Kashmir Valley & Ladakh will be eligible for transfer policy only after serving 8 years in SBI. For IBPS Clerk: A clerk after serving more than 5 years in a branch may be transferred to any other branch within the same city. If there are no other branches in the same city, then a clerk can be transferred outside the place within 40/100 km. After serving more than 10 years in a city he/she can get transfer to any place outside the city, within 40/100 km. For RBI: There is transfer after 5 years for assistant post. The salary structure of IBPS Clerk & SBI Clerk is almost similar but SBI has some additional allowances, therefore, the salary of an SBI Clerk is INR 2000 more than the IBPS Clerk Officer. Similarly, RBI assistant offers more salary than SBI clerk. Sabbatical leave of up to 2 years. For NABARD: It also provides various perks other than salary. NABARD’s accommodation is subjected to availability of same. It provides reimbursement of petrol for vehicle for official purpose, Newspaper, Brief Case, Book Grant, and allowance for furnishing of residence. Dispensary facility besides reimbursement of medical expenses for hospitalization, Leave Travel Concession (once in two years for self, spouse and eligible dependents) is also provided. Loans and Advances are provided at concessional rates of interest for purposes such as Housing, Vehicle, and Education etc. They are also given New Pension Scheme, in addition to the benefit of Gratuity. For RBI: RBI provides accommodation to the RBI Assistants depending on the availability. As NABARD, RBI also provides reimbursements for maintenance of vehicle for official purpose, newspaper, and briefcase, book Grant, allowance for the furnishing of residence, etc. Apart from reimbursement of medical expenses RBI assistants get dispensary facilities. Loans and Advances are granted to them at concessional rates of interest for basic amenities like Housing, Car, Education, etc. For SBI Clerk: The Clerks in SBI need to complete minimum 6 months of training period to get their employment confirmed in the State Bank of India. The 1st promotion can be made after completing 3 years in SBI. The promotion can be done in two ways – either In-Cadre Promotions or Officer Cadre Promotions. The candidates must appear in the written test conducted at inter banks level and qualify it. Then, a clerk can be promoted to the position of Trainee Officer. Based on the qualifications of JAIIB, CAIIB as well as Graduation and Post Graduation Mark sheets, the Clerks can be promoted to the position of Trainee or Probationary Officers. For RBI assistant: After serving for 10 years as an assistant, candidate will be promoted to special assistant and after that, for senior assistant. RBI conducts departmental examination after 5 years for assistant to become the Assistant Manager. For SBI: The selection procedure of SBI Clerk is conducted in four stages – preliminary, mains, and test of official/local language. Final selection is done on the basis of the candidate’s performance in the main exam. For IBPS: The selection procedure is conducted in 3 phases involving a preliminary exam, mains exam, language proficiency test and no interview. For RBI: It takes place in two stages: Preliminary Exam and Main Exam. The recruitment of the candidate is based on the scores obtained in the test followed by the Personal Interview. For NABARD: The selection process involves two phases – Preliminary & Mains exams. Here also, the final selection will be based on the Mains marks. This is how SBI clerk exam differs at various points from other exams. Choose accordingly. Download SBIClerk preparation app, and free study material, notes, mock test, subject-wise quizzes & previous year papers of SBI Clerk exam. Also check our NCERTSolutions app which we have launched recently for Class 6 – Class 12.